HomeProcrastination – the Thief of Time? 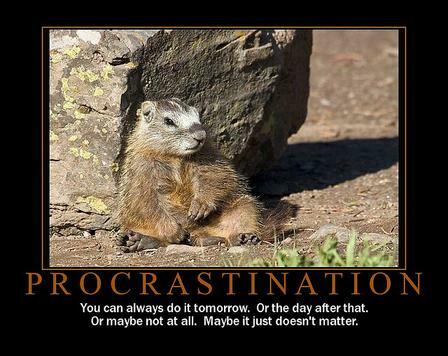 Procrastination – the Thief of Time? Recently the Harvard Business Review published an article by Chris Bailey on Research Based Strategies for Overcoming Procrastination. The premise of such articles is that procrastination is a bad idea. Whereas there is often a very good case to be made for not making decisions until an appropriate time. Quite often the answer to many difficult situations which seem to require immediate action is to “Stand and Wait”. The problem might go away. The situation might change. The immediate answer might not be available but may appear after a night’s sleep. As always one should make haste slowly. Innovation expert Daniel Burrus suggests that to get more done in less time, we should slow down. It may sound counter-intuitive, but doing so allows us to identify issues before they become problems, avoid tunnel vision, and embrace the bigger picture. Attention to the immediate moment can blind us to almost everything else.